The 2018 queer Olympics rolls on. Let the Figure Skating Team Competition hold its place in history as the first Winter Olympics event ever to showcase the talents of openly gay men. Out skaters Eric Radford and Adam Rippon, from Canada and the United States respectively, won medals Monday alongside colleagues from their homeland. But for now, it’s Dutch speed skater Ireen Wüst who has won the most medals, including an historic gold medal today. The Team Competition in figure skating kicked off Friday, when Canada’s Radford made history as the first out male Winter Olympian to compete at a games. 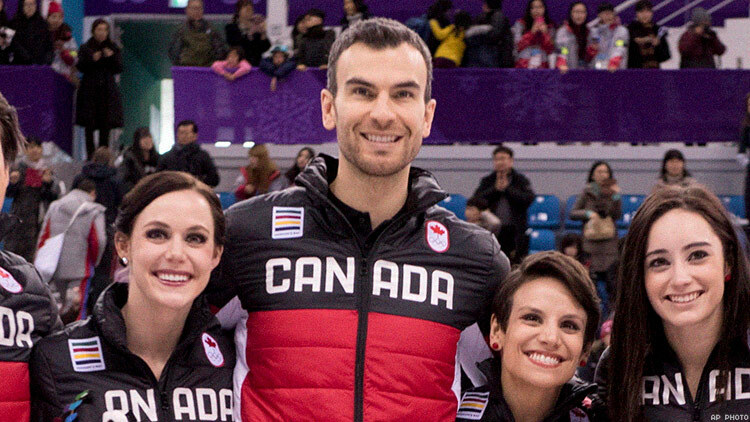 Alongside skating partner Meagan Duhamel, the two came in second in the short program behind Definitely-Not-Russia’s pair, Evgenia Tarasova and Vladamir Morozov, but came back on Sunday to win the free skate and contribute to a gold medal finish for Team Canada. This Olympics marks the second Olympics for Radford but the first since he came out in 2015. This is Radford and Duhamel’s first gold medal, and the pair look good heading into the Pairs competition later this week. Team USA picked up the bronze in the event, following a standout performance by Rippon, who skated the men’s free program. Rippon delivered a nearly flawless routine, though he took out any quad jumps to ensure a clean skate, and came in third place behind Canada's Patrick Chan and So-Not-Russia's Mikhail Kolyada despite those skaters suffering some nasty falls. This games marks Rippon’s first Olympics, and he told NBC that finally skating atop the rings logo was worth the wait. “If you ever have the option come to the Olympics, it’s a fun time,” he said. He also seemed to impress the normally judgmental Internet, with his name the top trending term on Twitter through much of Monday. Of course, the first out Olympian to medal in 2018 turned out to be legendary speed skater Wüst of the Netherlands, who earned a silver in the 3,000-meter on Saturday, part of a Dutch sweep of the event this year. Then today, Wüst made history by winning gold in the 1,500-meter. This makes the bisexual skater the first athlete from the Netherlands to win five gold medals and the first to win a gold in four different Olympic games; she won gold in her Olympic debut back in 2006 when she was only 19. American Brittany Bowe, the other out athlete in the 1,500-meter race, finished off the podium in fifth place. Denying Bowe a spot on the podium seems to Dutch fans a political statement. In the world of team sports, out defender Emilia Ramboldt and the Swedish Ladies’ Hockey Team on Saturday beat Japan 2-1 in the first women’s game of 2018 Olympics. As it happened, Ramboldt spent more time on the ice than anyone else on her team. Today, Sweden played the unified Korean team, shutting the host team out 8-0. In the Ladies’ Normal Downhill, Austrian skier Daniela Iraschko-Stolz, the out ski jumper who won silver in Sochi, came in sixth after jumping just 99 meters. The skier had done well in European competitions leading into the games but came off of a serious injury that sidelined her in 2017. The 34-year-old athlete had surgeries on both knees since her podium finish in Sochi. In other events, out snowboarders Sarka Pancochova of the Czech Republic and Cheryl Maas of The Netherlands today competed in Ladies’ Slopestyle but finished 16th and 23rd respectively, losing to American Jamie Anderson. Weather conditions led to finals being condensed into two runs, with most athletes still facing heavy wind conditioning. Maas made clear she didn’t agree with the decision to hold the contest today, after the event ultimately featured numerous falls and crashes. American Jamie Anderson ultimately won the event. Pancochova and Maas will both compete in qualifying for Big Air on Monday, Feb. 19. Australia’s out cross-country skier Barbara Jezeršek came in 39th in the Ladies’ 15-kilometer Skiathlon. Wüst will compete in the 1,000-meter on Wednesday, when Bowe again will skate as well. Team Pursuit kicks off next Monday, with both out speed skaters representing their respective nations as part of the teams. Radford returns to the ice with Duhamel for the Pairs Figure Skating competition, which holds its short program Wednesday and free skate on Thursday. Then Rippon and out Belgian skater Jorik Hendrickx will compete in Men’s Figure Skating, which holds the short program on Friday and free skate on Saturday. Sweden, with Ramboldt, will play Switzerland on Wednesday. Australian snowboarder Belle Brockhoff and Switzerland’s Simone Meilor, who are both competing out for a second Olympics, will compete in Ladies’ Snowboard Cross on Friday. On Sunday, gay American freeskier Gus Kenworthy will compete in Men’s Slopestyle, the event where he won silver in 2014. The same day, Bowe competes in the 500-meter in Speed Skating.